Belt buckle measures approximately 2" long, 3" wide, and will fit a belt that is up to 1-1/2" wide. You'll absolutely fall in love with this stunning belt buckle! This piece of Native American jewelry is Navajo overlay hand crafted by artist Stanley Gene, out of genuine sterling silver. Overlay is a process that utilizes at least two layers of sterling silver. One layer forms the foundation, while the second is used to design the individual detailed overlay. 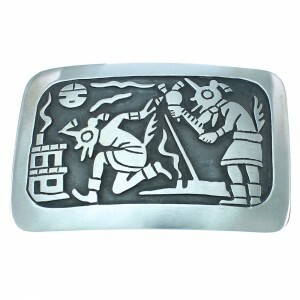 In this belt buckle, the second layer forms a fabulous Kachina Figure, Sunface along with other Native American designs that gives the piece an incredible finish. The Sunface represents warmth, shelter for the old, a bright future, and playfulness for the young. The belt buckle is stamped sterling and hallmarked. 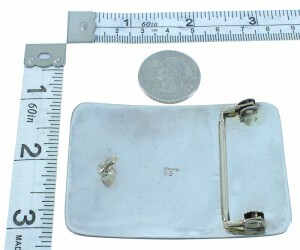 Belt buckle measures approximately 2" long, 3" wide, and will fit a belt that is up to 1-1/2" wide. e. de.